The sixth evening in the series of “Formate des Wir” starts with the publication Working Together: Notes on British Film Collectives in the 1970s (ed. Petra Bauer and Dan Kidner, 2013) and a discussion with Dan Kidner. The discussion will focus on questions about the historical work with collective, political practices from the perspective of contemporary curatorial and artistic research methods. 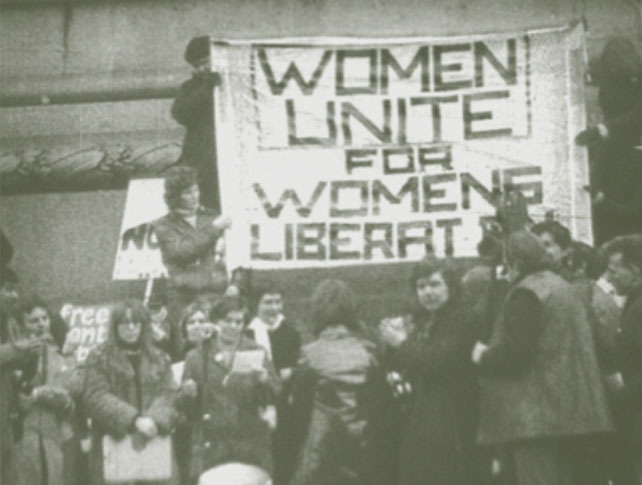 The discussion will be accompanied by screenings of short examples from the film collectives London Women’s Film Group, Berwick Street Film Collective and Cinema Action. Over the course of various events and edited transcripts of the related discussions, “Formate des WIR” has sought to tackle the complex and difficult questions of historiography. It’s precisely in using as an example a non-Berlin-specific project that this evening will present the role of “Formate des WIR” itself for discussion. The bookshop-publisher Archive Kabinett/Books – which has for years now provided a forum for an international discourse on contemporary publishing strategies – seems to be the perfect location for such an event. Dan Kidner is a curator and writer in London. From 2011 to 2013 he was director of Picture This in Bristol, and co-director of City Projects in London from 2004 to 2011. During the last ten years he has produced a number of artists’ films, including Full Firearms (2011) by Emily Wardill, Abyss (2010) by Knut Åsdam and The Empty Plan (2010) by Anja Kirschner and David Panos. During the current debates amongst producers of culture in Berlin it’s noticeable that – maybe too rarely? – things which have already been made, thought and done are brought up and passed on as knowledge. Since the 1960s, artistic processes have increasingly focussed on the assignation of meaning and modes of representation in art: this is a process of investigating models which are able to produce anti-hegemonial, discursive spaces for differentiated publics. This incorporates collective and hybrid forms of production, dissemination and distribution which, as artistic formats, call into question and transgress the prevailing conditions and mechanisms for exclusion in the established cultural institutions, the art market, and urban space itself. With the benefit of historical distance, “Formate des WIR” looks back on and examines Berlin.